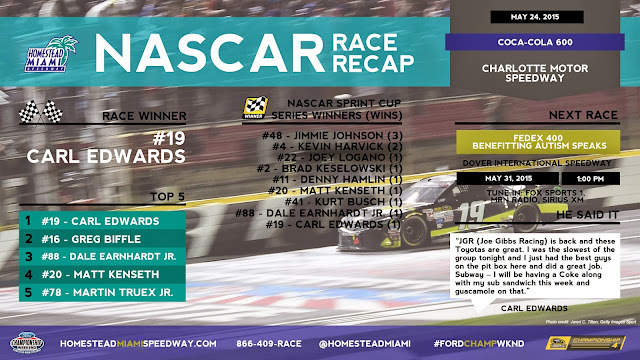 Carl Edwards won the 56th Annual COCA-COLA 600, his 24th victory in 385 NASCAR Sprint Cup Series races. This is his first victory and second top-10 finish in 2015. Edwards breaks a 31-race winless drought with the victory. This is his first victory and 14th top-10 finish in 21 races at Charlotte Motor Speedway. Edwards' previous best Charlotte finish was third, three times. Greg Biffle (second) posted his ninth top-10 finish in 25 races at Charlotte Motor Speedway. It is his second top-10 finish in 2015. Dale Earnhardt Jr. (third) posted his 12th top-10 finish in 31 races at Charlotte Motor Speedway. Kevin Harvick leads the point standings by 41 points over Martin Truex Jr.
Carl Edwards has two wins (2008, 2010) and two poles (2005, 2011) at Homestead-Miami Speedway. In addition, he has five top-5 finishes and seven top-10 finishes in 11 starts at Homestead-Miami Speedway.